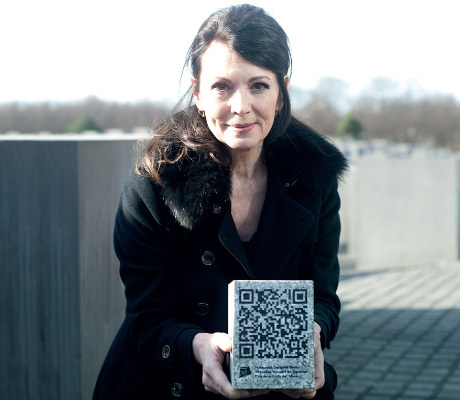 The QR Cobble is bringing the Internet to our roads and walkways. 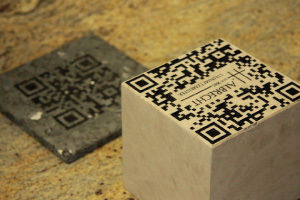 A new stone-working technique is being used to permanently engrave QR codes in paving stones. By simply scanning these codes with the smartphone, visitors are taken to websites containing information of interest about their current location. These are high quality, durable, non-slip and indestructible stones that attract attention without being obtrusive. 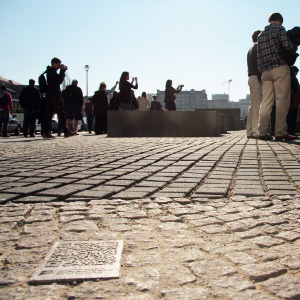 QR Cobbles can be permanently set into the ground, including on public streets and sidewalks. They comply with all relevant safety standards. 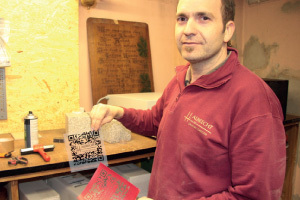 Besides QR codes, logos, claims or URLs can also be engraved onto the stones. Once set, they communicate the desired content 24 hours a day. 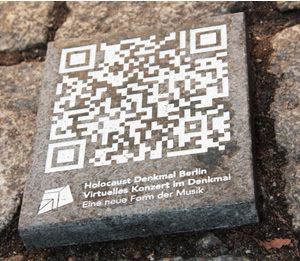 Berlin’s oldest stone cutter’s shop produces the QR Cobbles. 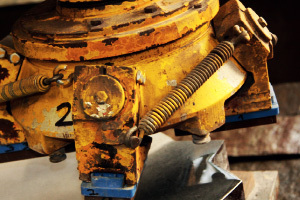 It combines traditional crafting with the most advanced machinery and technology. The Albrecht company, founded in 1880, processes the stones in the ordered material and size and according to highest quality standards. 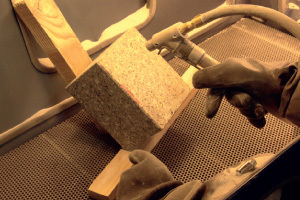 They then employ a new and innovative sandblasting technique to engrave the stones to order and then fill the recesses with special paint or natural resin. Impala is a popular deep dark gray granite from South Africa. 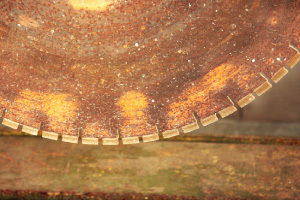 Due to its uniform mineral distribution, it is durable and frost resistant. Persisch Beige is a softer stone that can be processed easily. It stands for high aesthetic demands and high functionality. Marmor is a natural beauty grown in millions of years, classy in color and structure. Its unique texture makes it a coveted, precious work material. To build their roads, the ancient Romans used highly durable paving stones – many of these roads have survived to this day. QR Cobbles can be made in various sizes and materials to suit the needs of the target location. The stones can be laid indoors or outdoors, and their surface is specially processed to give them the required non-slip properties. The stones can be imprinted with any lettering or pattern desired. QR Cobbles can be produced in every size. In the 21st century, all contents imaginable are available in the virtual world of the Internet, always up to date and accessible at any time and at any place. A lot of the actual content is linked to specific locations and occasions. At the locations themselves, however, it is not always easy to get the message across properly. Conventional plaques or signs are expensive or just don’t get noticed. The Cobble solution finally gives people fast access to the information they want and need in real-time. In 2008 a concert was performed within the “field of stelea” that make up the Holocaust Memorial. More than 3,000 people came to hear the performance while moving freely through and around the memorial site. This meant that the listening experience was different for each person. The concert can now be heard by visitors of the memorial using the world’s first virtual concert for smartphone app (www.virtuelleskonzert.com). At the site itself, making visitors aware of this concert app was quite a challenge until the QR Cobbles, more than 20 in all, were placed around the memorial. Since then, these stones have discreetly but successfully drawn the guests’ attention to the virtual concert. 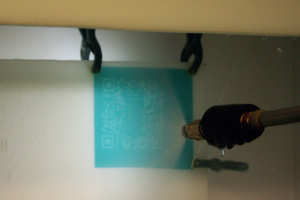 QR codes are easy to scan using any smartphone. 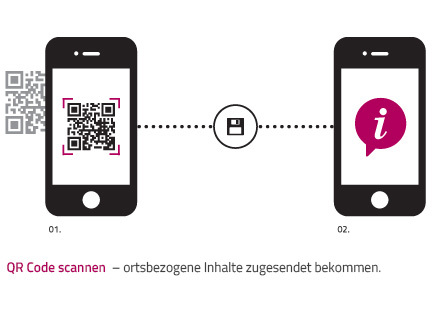 Most smartphones come with a pre-installed QR scanner , otherwise there are free downloads. The codes on the cobblestones connect users directly to the desired online content. This may be general information or details concerning the place or adapted to the time the code was scanned. This way, users get fast and easy access to the information they are looking for. Users may be taken to mobile or conventional Internet content, to smartphone applications or to specific data. The content providers may replace, update or edit their content at any time. 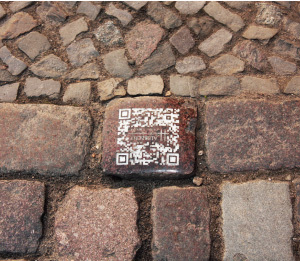 The QR Cobble with integrated WIFI represents a further step into the future. 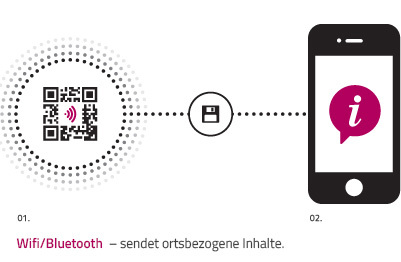 It allows data to be transmitted across a distance of several meters without the need to actually scan the QR Cobble. It also allows to match data to different audiences, making it possible to assign content more precisely to users on site.